100% of all auction proceeds go to the Byrne family. AB's Final Board: 6'1"x 19 1/2"x 2 1/2" This board is the last board shaped by Allan Byrne on 31/7/13 and is an amazing tribute to the master of the 6 Channel Bottom. 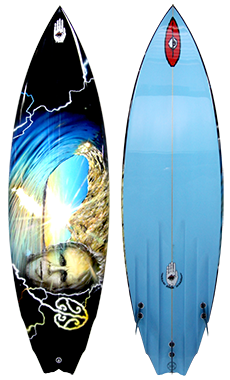 With a custom airbrush by Christian Chapman and glassed and finished by Dale Wilson this is a true collectors item and represents the final chapter in a life that shaped the surfing industry all around the world. Tube rider extraordinaire, master of surfboard design, graceful stylist in the water, happy family man: Al Byrne was all four. He was also a sly, cheeky man with a thinly disguised larrikin streak, who constantly played tricks on his custom clients (they’d inevitably end up friends). 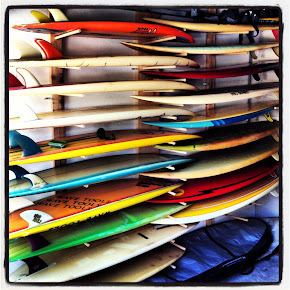 “Nah, it’s not ready yet, mate,” he’d say when you showed up at the factory, hoping to see your new board. He’d watch your expression with a half suppressed grin, then pull out the board, burnished and slick from its final rubdown, and laugh as your face changed. A lot of surfboard makers say it, but for AB it was a home truth: there was nothing he liked better than stoking you out with the best board of your life. 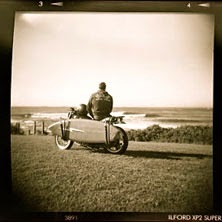 AB grew up in New Zealand and features in a short sequence of the movie Endless Summer at small Raglan on a longboard. 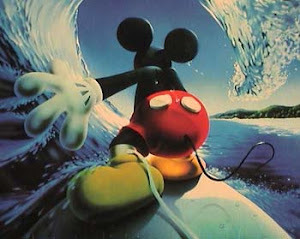 It was a fluky experience for a kid who’d been surfing for just a year at the time, but it was also symbolic. 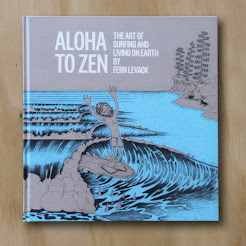 This was a surfer who was into surfing’s modern arc from the get-go, and who lived it to the core. He was born in Hamilton and started surfing in 1962 after his father, Des, made him a board. According to “Gone Surfing”, Luke Williamson’s history of New Zealand surfing, Des was a handyman who’d built surf skis from blueprints in Popular Mechanics magazines. After Des saw some Malibu boards at a surf carnival in Gisborne, he made two -- one for AB and one for his older brother Terry -- just from memory. “He thought it would be good for taking out the set lines we used for fishing,” AB told Williamson. 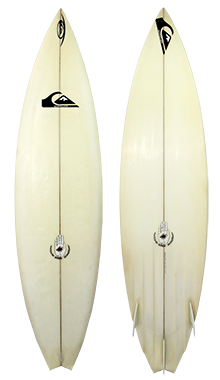 This 7"10" gun donated by renowned big wave surfer David Scard (Scardy) shows the essence of AB's skills to make the perfect board for the perfect day. "For me personally, riding Allan's boards the past 12 years out at G-Land as well as many other pumping waves around the world has certainly allowed safe passage through the biggest and craziest barrels of my lifetime. Al went on to win the NZ junior title at 13 years of age, eventually winning four national open titles including a junior-open double in 1967, and representing New Zealand at the famed 1966 world contest in San Diego. He was only 15 at the time and it spawned a love of travel that never left him. 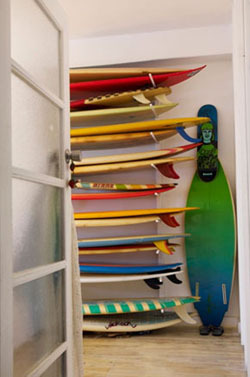 He learned to make surfboards under the tutelage of ex-Australian surfer Bob Davie, who’d moved to NZ from Sydney in 1964. Three years later Davie, by then an established figure in New Zealand’s surfing community, offered the school-leaving Al a job as a rookie shaper. He also offered Des Byrne a job as factory manager, making the business somewhat of a family affair. Al was always vocal in his acknowledgement of Davie’s influence, both on his own surfing life and on NZ’s as a whole. 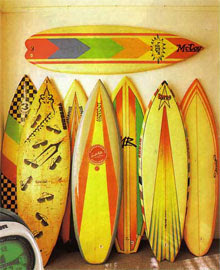 He claimed Hawaii’s Mike Diffenderfer as his main design influence beyond Bob; Diff’s down rail and hard tail rocker remained visible under AB’s lines for the rest of his career. AB represented NZ again at the 1968 world contest in Puerto Rico. After the contest, David Nuuhiwa and Reno Abellira took him under their wings, taking him surfing in the Virgin Islands and driving him around Los Angeles in David’s Porsche. He visited the US several times in the late ‘60s and early ‘70s, staying in San Diego and working with well-known local shaper Bill Caster. In 1973, back home and needing a break, AB joined the Royal New Zealand Air Force as a cadet. The experience -- especially the wind tunnel testing sessions he got to watch first hand -- got him thinking in different ways about speed and how a surfboard’s surfaces could be worked toward reducing drag. It was the kind of thinking that offset his own minimalist and highly effective surfing style; he always sought the fastest cleanest lines, both on a wave and in his boards. He moved to the Gold Coast in 1977, part of the migration of notable talent to Burleigh and environs at the time. He met his future wife Jane, and worked in the Hot Stuff factory where he made boards for a range of team riders including Wayne Bartholomew, Peter Lawrence, Wayne McKewen, Chappy Jennings and many others. His friendship with Colin Smith, the great goofyfooter from Redhead near Newcastle, was formative in his embrace of the channel concept. Col rode Jim Pollard’s eight channel “bee-tail” designs to success in Hawaii and Australia, winning a national title and the Pro-Class trials. AB and Col shared similar surfing styles and levels of passion for the art of surfing -- and make no mistake, they saw it as art. 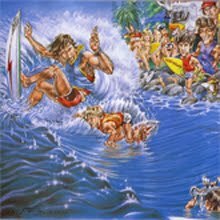 Sitting in on one of their long discussions, usually accompanied by some herb or other, was one of the great learning experiences for many younger surfers of the time. 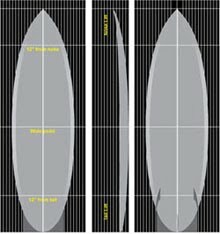 Al tweaked the Pollard channel idea, putting a hard edge along the inside line of each channel so they began to resemble “clinker” boat hull designs. He also began cutting single concave entries into the channels. This, welded with his Diff-inspired rail lines and rockers and a very Brewer-influenced forward foil, soon made his boards into something extraordinary. 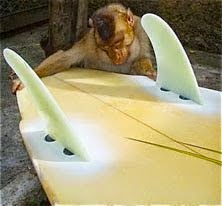 His advanced surfing skills made him his own best test pilot. From Bali to Hawaii, Al became one of a select few elegant, highly respected tuberiding goofies -- the likes of Smithy, Peter McCabe and Bruce Hansel, who flowed in Gerry Lopez’s wake with every bit of Gerry’s fine tuned barrel riding. AB and Simon Anderson surfed a famous Pipeline Masters final in 1981. While there were seven guys competing, the pair were a step ahead of the field, Simon with his newfangled Thruster, AB with the three best waves of the day (the final was scored on best five). 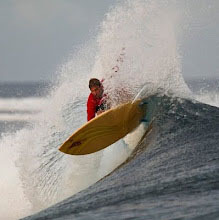 The two surfer-shapers had great respect for each other, but AB gently mocked the Thruster idea at first, recalling once saying to some mates who’d got Simon’s idea and tried it: “If you think putting a couple of little fins on the rail is gonna make your board go better, you’re tripping.” But he changed his tune swiftly after experimenting with three-fin clusters, and soon they were part of the AB six channel deal. Up for auction: AB's first tow board. Made in the Mid 1990s at the very early stages of tow surfing this 7'6"x 16" Concave Bottom, Round Square Tail tow board was shaped by Allan Byrne to surf Jaws with his good friend Darrick Doerner. Darrick and AB didn't have a jetski as used today so they would just use a rubberducky to tow in on the biggest days Jaws has to offer. Rabbit rode them in Hawaii and put on a hell of a show, but it was Gary Elkerton who took the big six to its logical limit. Kong first showed up on the North Shore in 1982 with an AB quiver and made his presence felt like few others. By the mid-1980s he was the dominant young surfer at Sunset Beach, riding a hard rockered 8’0” and blowing everyone away with massive fades, carves and barrels, all accomplished with the big six’s most obvious performance attribute: speed. The boards were unbelievably fast. Kong once said his greatest fear was that Martin Potter would get hold of one. 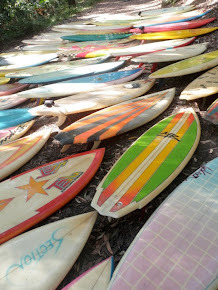 Despite their obvious advantages, most boardmakers avoided the channels. They were hard to fit into a conventional rocker, and besides, the glassers and sanders hated them. AB would therefore team up with guys as committed as he was to the idea, like his long-time offsider Steve “Vonno” McDuell of V8 Glassing. The little V8 logo on the underside of the tail told you Vonno had done the sanding, so you could be reasonably confident the rail edges wouldn’t crack. By the mid-‘80s, AB had moved on from Hot Stuff and started his own label, Byrning Spears, though he kept a lifelong friendship with HS owner Paul Hallas, with whom he practiced karate regularly. After Colin Smith passed away from cancer in 1988, AB kept the family connection going, shaping quivers for Col’s highly talented son Rique. In more recent times AB teamed up with Dale Wilson in the former Hot Stuff factory out the back of Currumbin. 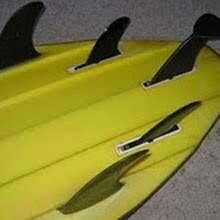 Out of the humblest of sheds would emerge these ridiculously sculpted boards, to be wet-sanded by Dale with a hose in the carpark. Al had struggled with a range of health issues in the past decade, including major heart surgery and long-term complications arising from an artery graft. The blood-thinner Warfarin, in his system at the time of the bike accident that led to his death, was one reason that surgery to release pressure on the brain could not be performed. AB’s list of friends is very long, a testament to his positive nature and desire to see the best in people, but the closest ones over time were core surfers – guys like Col, and Darrick Doerner, who shared his aesthetic sense of surfing as a spirit, a special sort of magic set apart from the rest of the world. 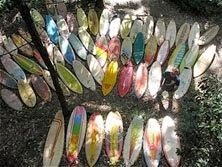 And his wife Jane, who shared his playfulness and love of the surf. The sense was that with Jane, Al knew what side his bread had been buttered. He was always trying to figure out how he could get an extra week in Hawaii each winter, and somehow Jane always let him talk her round. But he always got a kick out of shaping Jane a good board, and like many couples whose bond is strong, they seemed to grow happier as the years went on. Al is survived by Jane and their three sons, Jamie, Matt and Michael. He was 62. 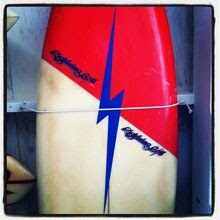 Tom Carroll's personal 6 channel rider.